My journey into raw foodism and cleansing began when I moved in with a small group of free thinkers, and one of the women would often raise her fist in the air and proclaim, “Raw food!” with great enthusiasm. I had been searching for a cure for facial eczema for years, and after this same woman handed me a copy of Arnold Ehret’s Mucusless Diet Healing System, in which it read, “This diet alone can heal every case of ‘disease …’, I felt I had a no-fail plan. So, with “unshakable faith,” I surged forward into the land of detox and cleansing. After only two weeks on the raw food diet, as well as a superdisciplined “eat only when hungry and never overeat” policy, I had watched my eczema quickly disappear. I was so taken by the other dramatic changes I was experiencing that I continued in the same manner—this was too good to be true! I had an entirely new outlook on life. I felt alive. I had a brand-new sense of confidence. I became keenly interested in so many new things. Everything was fascinating. My yoga and meditation practices improved tenfold. Really, I couldn’t believe what was happening to me! Within the first month, I knew that I had to document what was happening to me, and in order to properly demonstrate the changes I was experiencing, I needed to document my life before going raw as well. 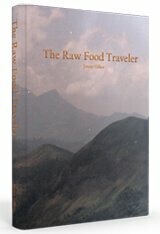 I began studiously piecing together a book that would become The Raw Food Traveler. 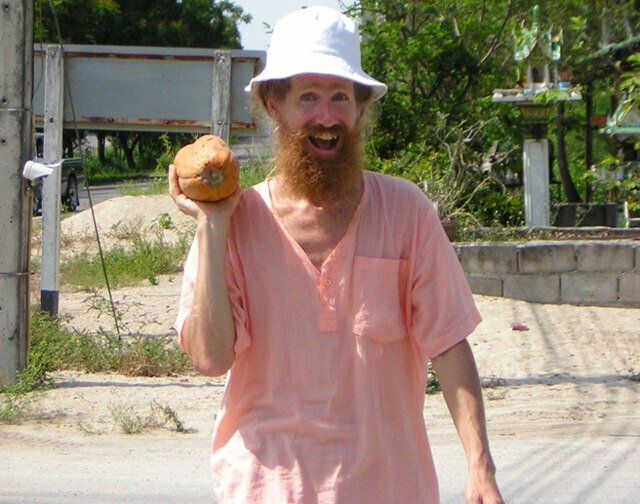 I became so inspired to venture out of the cold Montreal winter that, within the first few months of going raw, I had sold much of my belongings and was set to use this money to embark on a journey that would take me closer to some of the greatest fruit-growing areas of the world. British Columbia, Hawaii, Northern Australia, Indonesia, Malaysia, Thailand and India were some of these destinations. 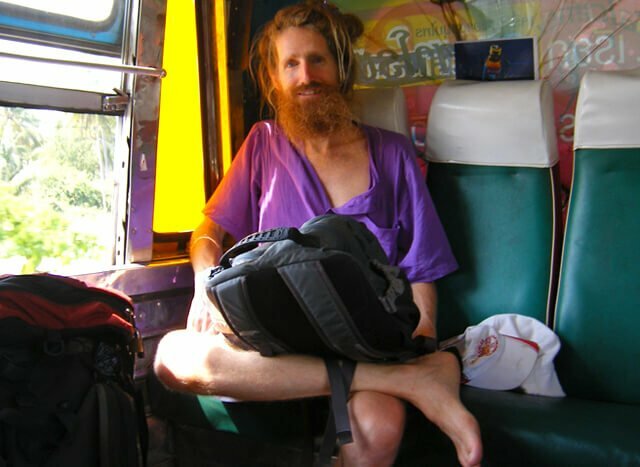 Author of The Raw Food Traveler, Jimmy Gilker poses on a bus in Thailand. My first winter on raw and going through rapid weight loss and heavy detox became pretty challenging after a few months, but as spring came into the picture, I was feeling more alive, not to mention warmer, and set my sights on picking fruit in the orchards of British Columbia, Canada. Cherries, peaches and apricots were on the menu, and I definitely ate my fill for three or four solid months. Any slowing of the bowels that I had experienced in the frozen Canadian winter was now being made up for. Things had been set free, and my energy skyrocketed like never before. As the temperatures began to drop in B.C., I gathered myself and headed off to the island of Maui in Hawaii. This was paradise. There were avocado, mango and papaya trees everywhere, and they were literally raining fruit. It wasn’t long before I had come across wild spinach at the forest edges and purslane by the seaside. I was set. For three months, I foraged almost all my food and lived under a tarp on the mountainside next to a bamboo forest. Nights were spent listening to the waves crashing against the rocks almost a kilometer away and writing The Raw Food Traveler. 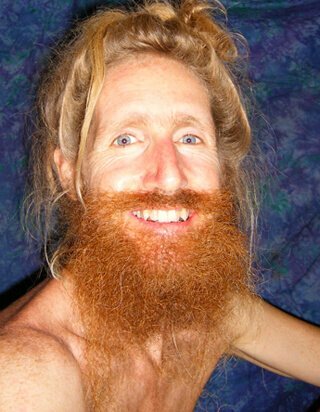 In early January 2000, I flew down to Australia with a plan to visit the World Rainbow Gathering, inland from the Byron Bay area. Although I did indeed love the beaches of Australia dearly, I was a little less enamored with the fruit scene. I kept expecting a repeat of Hawaii. Maui is a tough act to follow! Nonetheless, I made some fantastic friends, one of whom was a fruitarian named Mango. As my three months in Oz were drawing to a close, we decided to go to Indonesia together to the island of Sumatra. We rented a bungalow by Lake Maninjau for a month. When we weren’t enjoying the water and its spectacular backdrop of mountains, we were exploring the local fruit markets. We never did really score any durians in Sumatra, and every jackfruit and cempedak we came across was rock hard. Soooo … I decided to go on my own to Malaysia and then Thailand. Jimmy hoists a fruit find! I sat down to my first real durian outside a supermarket in Malacca, Malaysia. It was divine. Really, I couldn’t believe that I was eating just a simple fruit in its natural state. There was no seasoning or anything else added. It was just a simple fruit. After eating a diet of 100 percent raw fruits and vegetables for several months now and assuming that that would be the way I would eat forever moving forward, I couldn’t believe that I was so lucky as to be able to include this in my diet without compromises. This experience marked the beginning of my life as a durian lover and launched a period that would last for a few years following durian seasons throughout Thailand and Malaysia, including the island of Borneo. Only a week or so passed before I headed north to Thailand, where I truly fell in love with the people, the landscapes and, most certainly, with the Thai fruit scene. Wow. I had never experienced anything like that. Durians, mangos and papayas were in abundance at every fresh market I went to. From the far south to the island of Ko Phangan, up to Bangkok, and then north to Sukhothai, there were fruit and veggies everywhere! After a few months, my funds began to dwindle, and I quickly secured a job teaching English. This lasted for nine months or so before I could no longer take the restrictions of a daily job. I needed to head south to the islands and beaches. There, I continued to write my book. It was a labor of love. In the few months that followed, along with writing my book, I did a few weeklong water fasts. By now it was summer again in Canada, and I decided to go back to Montreal for a few months to visit family and friends and to earn money to return to Thailand before the winter kicked in again. I loved my time in Montreal and continued to work on my book, making some serious headway. I was very pleased how things were turning out, and I envisioned myself heading back to Thailand in January, renting land by a river and building a small house where I would continue writing my book. 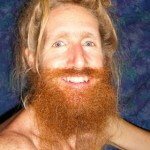 I also planned to continue with herbal cleansing as well as water fasting. The plan manifested to a tee, and the book was completed. In the years that followed, my travels continued and took me to India, Thailand, Malaysia, Mexico, home to Canada again and back to Australia. Eager for a change of lifestyle, my heart longed to find a more permanent home and a community to be a part of. After finding myself in Australia, I was convinced I had found my place. However, as usually, the Universe had her own set of plans for me. Due to visas and the legality of remaining in Australia, after a full year I had to leave and headed straight to Costa Rica, where life in the tropics was summoning me once again. It was only a matter of months before I realized that this was where I wanted to be. Only a year passed before I began building my dream home on the edge of the forest. 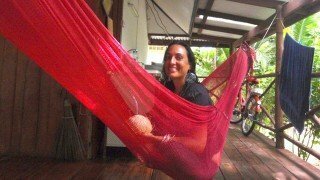 This is where I now reside in Costa Rica with my beautiful partner, Jenée, and our many lovely banana bushes. When I’m not at the computer building websites, Jenée and I spend much of our time running in the mountains together, swimming in the sea or just watching the sunset from the balcony hammock. My name is Jimmy and I have lived on a raw food diet since 2000, sampling some of the world's finest fruits in places like India, Thailand, Borneo, Hawaii and Australia. When I am not busy building websites, I can be found running in the mountains of Costa Rica, swimming in the rivers, frolicking at the beach, lying in the hammock or playing guitar.